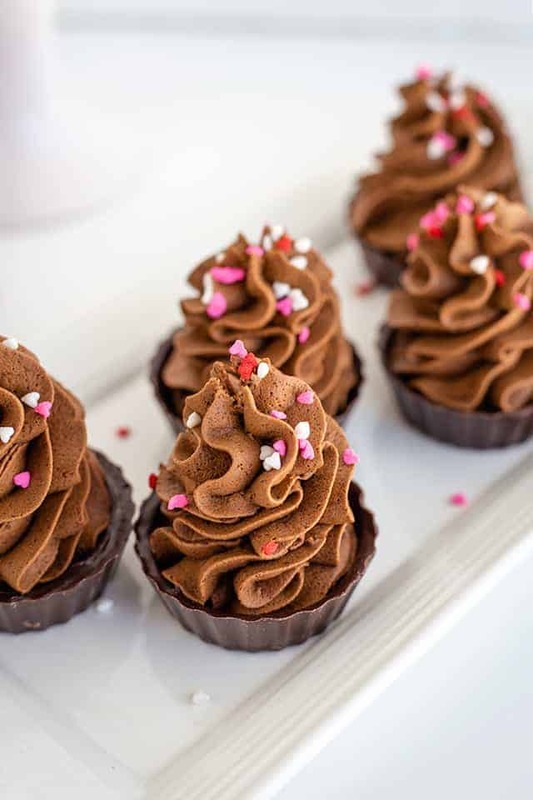 These Chocolate Mousse Cups are a simple 4 ingredient recipe. 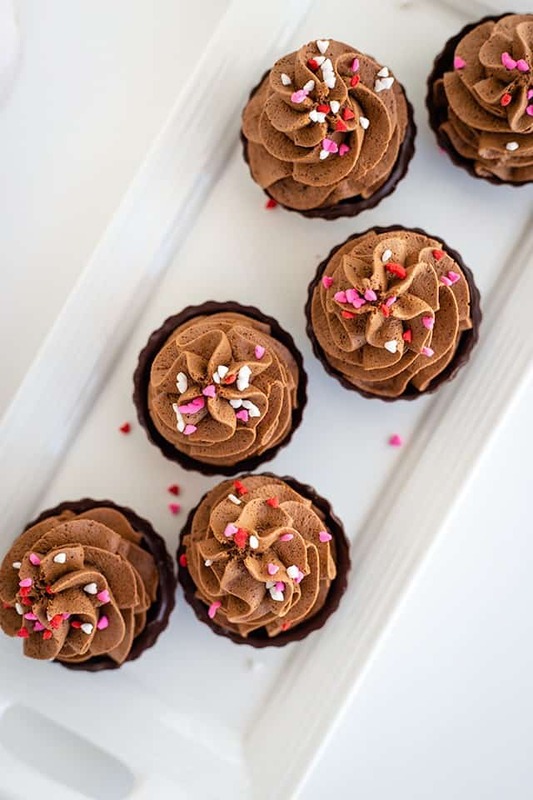 They make a great little treat for a Valentine’s Day party for kids or just for the chocolate lovers to have in their fridge. I whipped these up the other day for a quick treat. 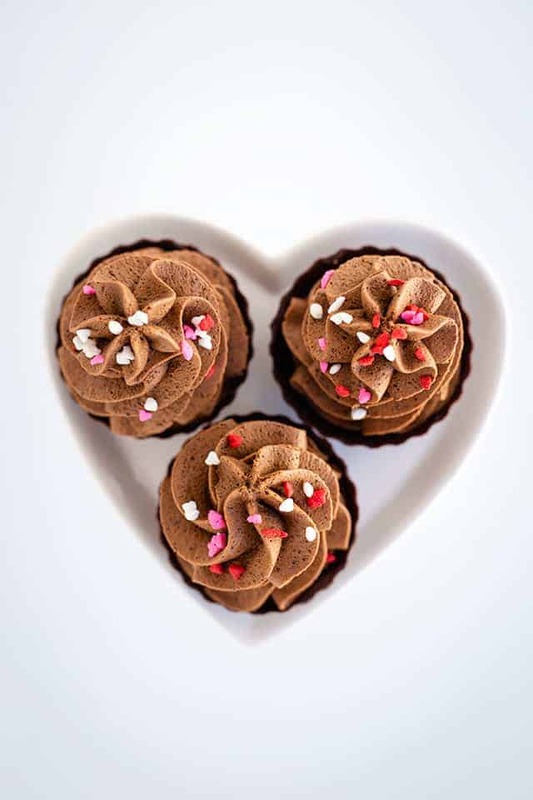 Plus, Valentine’s Day is coming and I know everyone loves a decadent chocolate dessert recipe. I’m hoping to get a second one up for you the beginning of next week. It’s a cake recipe and it’s ALL chocolate. I’ve made chocolate mousse several different ways, but this is by far the easiest. Before we talk about how to make this easy chocolate mousse, let’s make sure you have the ingredients on hand. I truly prefer the taste of Hershey’s brand chocolate pudding above all other brands. It gives me the flavor that I’m looking for. I happen to always have some on hand just in case I want to whip up my double chocolate chip pudding cookies that everyone raves about. To make this easy chocolate mousse recipe, start by whipping up the heavy cream and powdered sugar with a hand mixer. Once it gets to a soft peak stage, add the dry pudding mix to the whipped cream. Whip the dry pudding mix into the whipped cream until stiff peaks form. The pudding mix will seem slightly grainy at first, but it dissolves quickly. 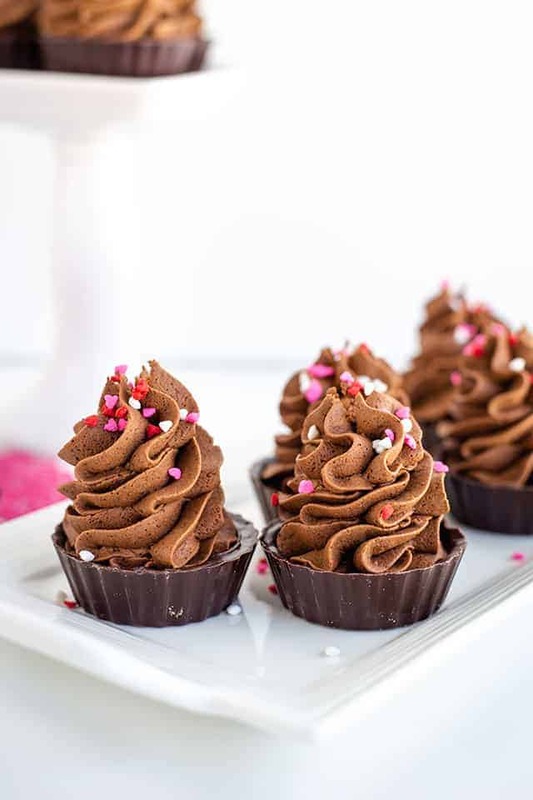 This chocolate mousse recipe will hold up in the fridge for several days without becoming runny. It pipes very nicely and holds its shape. 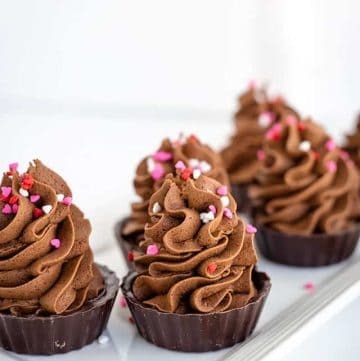 My chocolate dessert cups were store-bought because I was going for a simple recipe. I bought them at Walmart in the baking aisle, but you can also grab them on Amazon. I with the ChocoMaker brand. 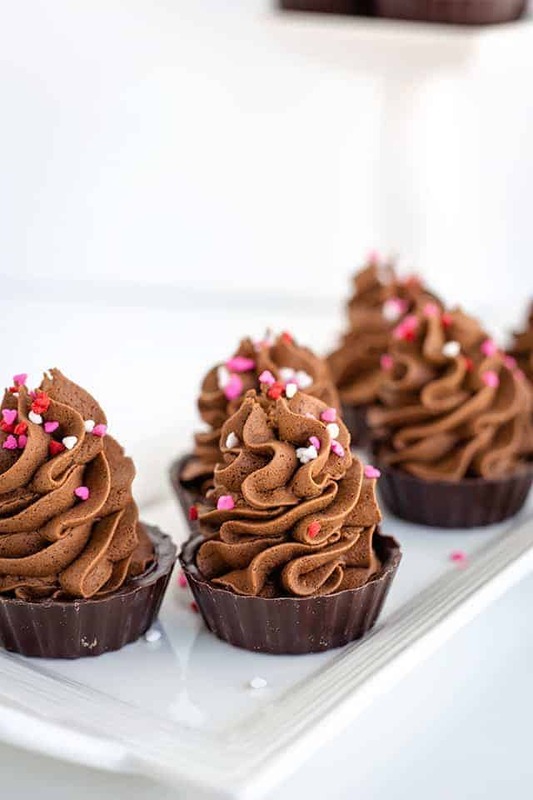 Can I make these chocolate cups at home? Yes! You’ll need some sturdy baking cups, preferably foil baking cups or silicone baking cups. Grab some candy melts and have a clean food grade brush on hand. Melt the candy melts by microwaving them in a microwave-safe container in 30-second intervals and stirring afterward. Repeat until the candy melts are smooth. Next step, either spoon the chocolate into the baking cup and tip it slightly on its side to cover the sides while turning the baking cup, or paint the sides with your brush. Try to make sure the layer is pretty even. Let the chocolate harden and add another layer to the sides of the cups to make sure they’re thick enough to not break. If you’re using a paintbrush, you may need to do one or two extra layers depending on how thick you apply the coats of chocolate. Let the chocolate harden completely. I would peel the foil wrapper away only after you’ve filled it with mousse. The fewer fingerprints on your chocolate cup, the better. In a mixing bowl, add in the heavy cream and powdered sugar. Beat until soft peaks start to form. Add in the instant chocolate pudding mix. Continue to beat until it becomes thick and smooth. Add the mousse into a piping bag with a 1M tip. Pipe tall swirls of mousse in each chocolate cup. Garnish with some heart sprinkles or chocolate curls. powdered sugar or granulated, you have granulated in the ingredients but powdered in the instructions? Sorry about that! It’s powdered sugar.